Florida boasts some of the best fishing in the world, and the Daytona Beach area is no exception. Whether you’re winding through the backwaters in a canoe or trolling offshore on a charter, there are endless ways to experience a fishing adventure here. In fact, some of the most easily accessible fishing is done right off the beach. To help ensure a fun and safe experience for everyone, make sure you review the tips below on best practices for surf fishing. Properly gearing up is the best way to kick off your beach excursion. For surf fishing, you’ll want to make sure you’re working with a rod and reel built for saltwater. Typically, heavier rods that are anywhere between eight and 16 feet long are used in the surf. Your rod choice will depend on the type of casting you do and the reel you want to use, but one of a medium weight will probably be your best bet. You’ll also want to make sure you get the ideal fishing line weight, probably between 15 and 20 pounds. This affords you enough strength to reel in a big fish, but won’t drag you around with the current too much. Try tossing your cast net for a fun way to catch live bait. If that’s not available to you, you can always swing by a local tackle shop for bait. In fact, The Fishin’ Hole has you covered in all areas of fishing and tackle — you can get everything from fishing line to sand spikes to sunglasses there. Purchase at area bait and tackle shops, and sporting goods stores. Note that there are several fishing activities in the Daytona Beach area that don’t require a fishing license, including fishing on chartered fishing trips or party boats, and fishing off a licensed pier if you are under the age of 16. For more information about the rules and regulations related to fresh and saltwater fishing licenses, please visit the Florida Fish and Wildlife Conservation Commission website. Use common sense and only fish in designated areas — and not right in front of a group of swimmers or children on the beach. Practice common courtesy so that everyone can enjoy a relaxing beach experience. Clean up after yourself! Fishing line and other trash can damage the environment and kill the animals and birds that dwell in the area. Do your part to clear any litter and leave our beaches as beautiful as when you arrived so that the next angler can enjoy them, too. When visiting the beach, please do not disturb the turtle nests, which are denoted by fencing. Help us protect endangered sea turtles! And finally, the most important rule: Have fun! Whether you are teaching your young child how to bait a hook for the first time or simply trying to catch peace of mind, fishing in Daytona Beach is a fun way to spend time connecting with nature. 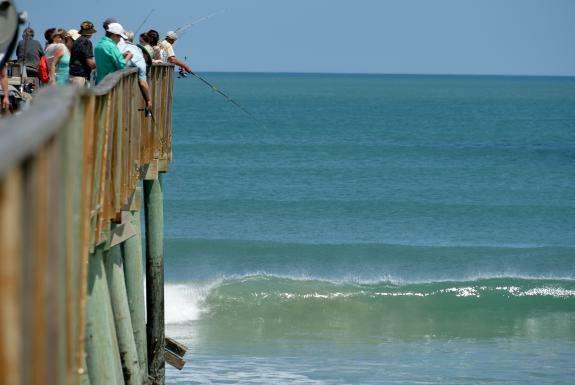 But the fun doesn’t end with surf fishing — the area is full of unlimited outdoor adventures. Start planning your trip today!